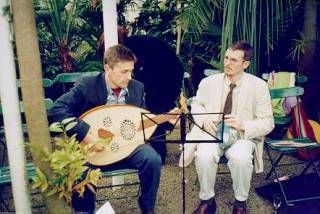 Tony Langlois (left) gained his PhD in 1997 at Queen's University, Belfast, with a thesis on Algerian and Moroccan Rai Music. His published articles include work on North African popular and ritual musics, and 'Rave' culture in the UK. Tony Langlois has taught Ethnomusicology and Anthropology at Queen's and Trinity College, Dublin. He has also taught Cultural Studies for the Open University in Ireland. He is currently working with the Cultural Diversity Programme of the Northern Ireland Community Relations Council.